If you would like to use the contact's CRM user as sender in your mailing you have to use special merge tags. Set [mssys_crm_user_name/"Sender name"] value to sender name. If there is no CRM user set to the contact then the name between quotes will be used as sender name. 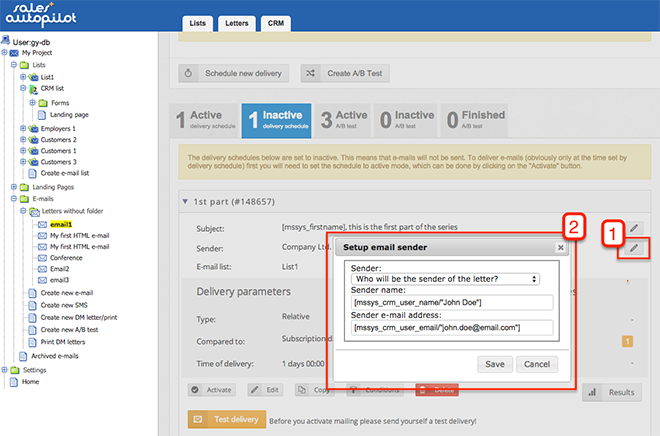 Set [mssys_crm_user_email/"sender@nocrmuser.com"] value to sender email. If there is no CRM user set to the contact then the email address between quotes will be used as sender email.